The yearly worship event which holds in Abuja Nigeria’s capital city has gathered over 9000 worshippers since inception. 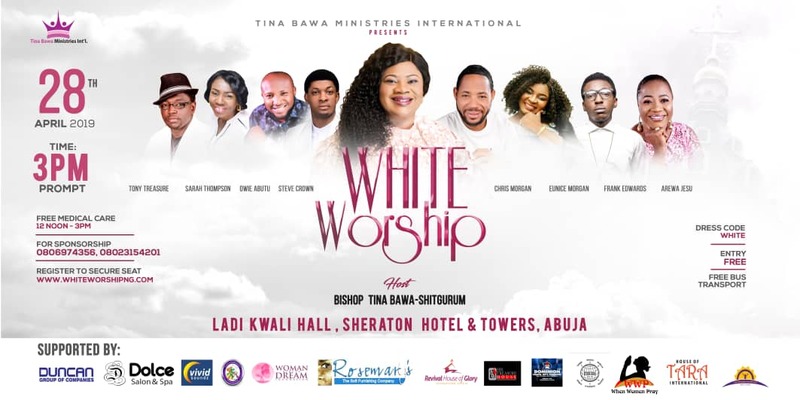 The event is a brainchild of Tina Bawa Ministries Int’l whose primary focus is to bring men and women from diverse culture and denomination to Worship Him In The Evening (WHITE) It is an evening of Yada were miracles happen. Come and be a part of an unforgettable experience in worship. Her Lordship Bishop Tina Bawa-Shitgurum is the Apostolic Bishop of the Urban MarketPlace, Nigeria and she use every platform to reach out to students, young adults, women, Men, girls and people living with disabilities amongst us. From the beginning of the year, she has hosted and empowers women through the Extraordinary Women Fellowship International an arm of the ministry With the theme: The Deborah Generation. During these Programs and outreaches, she gives free medical care to thousands of people. The 2019 edition of White worship will feature an array of great gospel music ministers like Frank Edwards, Chris Morgan, Steve Crown, Arewa Jesu, Sarah Thompson, Tony Treasure, Eunice Morgan, Owie Abutu, Toluwanimee, Chris Ade, Emmasings and more. 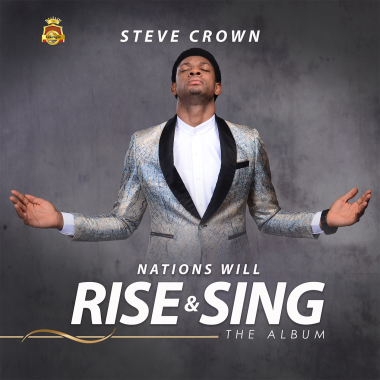 Popular Nigerian Gospel music minister, Steve Crown drops his second studio album titled, “Nations Will Rise And Sing” today. According to the release from his Record Label, Lakelight Entertainment, the album is a 9-tracker album loaded with some of his popular songs already enjoying massive airplay worldwide. Steve Crown came to limelight after the released of his popular track “YOU ARE GREAT” in 2014. The song has gradually grown to become a world class anthem. Below links are for downloads. 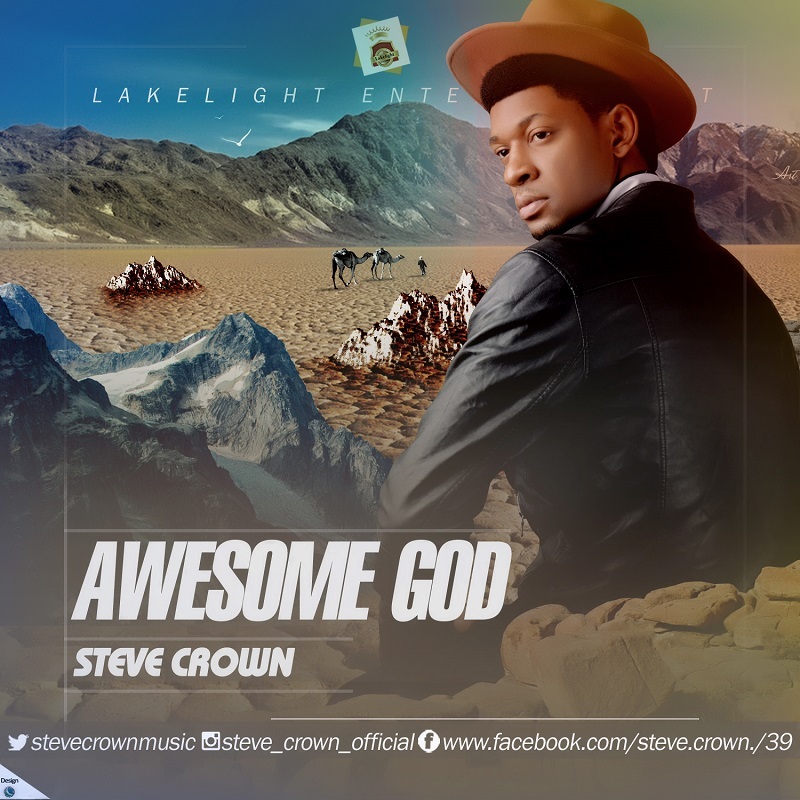 After so much anticipation You Are Great Crooner Steve Crown is out with yet another incredible sound of worship that will boost you into a higher realm of Worship. The single off his forthcoming album is a masterpiece that will continuously re-echo in your heart in appreciation to God. All The Glory is simply put a song of thanksgiving and appreciation for all that God is doing and still doing in the life of his Children. It’s been a great year bagging so many award nominations nationally and internationally. Notably nominated for Bagmaawards in two categories and Aeleawards with the likes of Sinach, Sonnie badu, Frank Edwards and others in same category. I believe God is about to do great things in the land and the revival will happen through worship. Awesome God is a project that proclaims His majesty and mighty deeds across the universe. Awesome God is also available across other digital sales platforms. 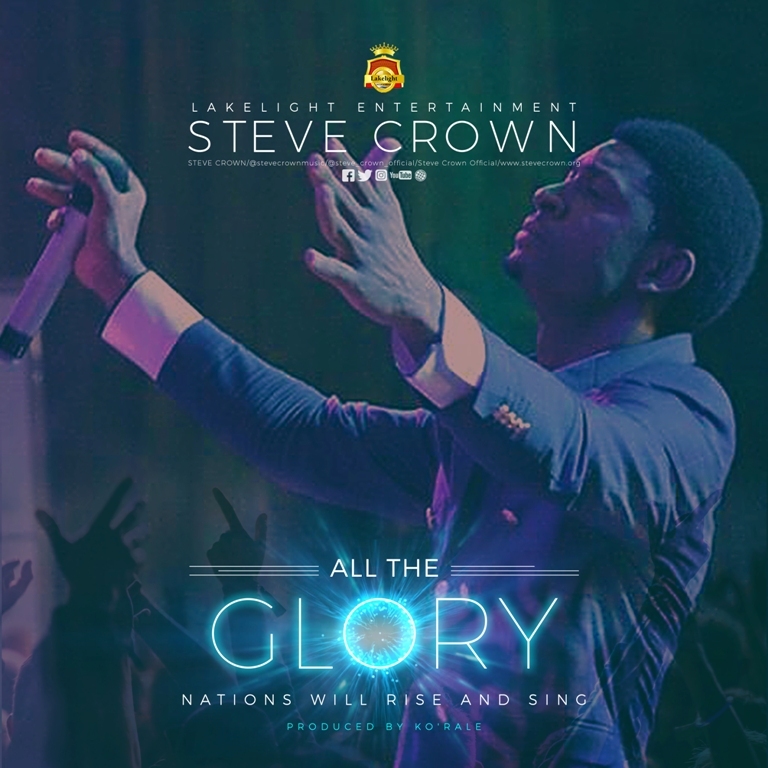 Abuja based talented gospel artiste Steve Crown after the official release of his video album for You Are God, he returns with a single off the album for free download. We Wait On You is a deep worship song that will definitely assist your worship lifestyle. Steve Crown recently got Diaspora Entertainment Awards (USA) nomination for Best Gospel Song and Best Gospel Artiste. 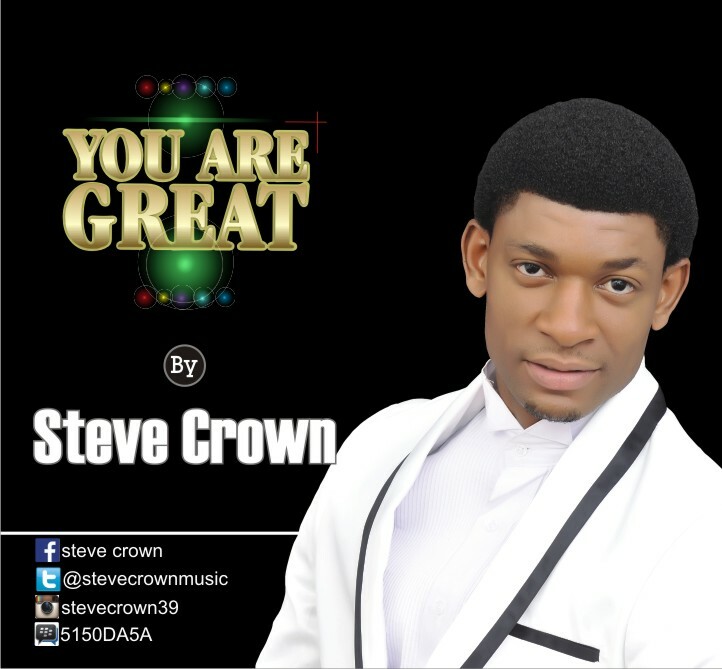 Steve Crown is out with the video to his hit gospel song titled “You Are Great”. Steve Crown Okolo, born into a family of six hails from Benue state. He portrayed interest in music at the age of four and joined Saint John’s Anglican Church choir at the age of seven, he was a member of the famous children’s happiness club named Deacon Kids Band. He has shared stage with many great gospel artist, sang in concerts, crusades, served as Music director in several choirs and singing groups till date. He is a contemporary gospel singer, songwriter and composer and the founder and CEO of LAKELIGHT ENTERTAINMENT with a vision to save the lost souls, lifting lives, help the world discover the Greatness of God, his sovereignty and awesomeness with emphasis of his unending love for mankind through his divinely inspired songs. Beyond words, express your love to God in deep worship. Be blessed as you watch and listen.